Australia has more than 40 species of funnel-web spider which fall into two genera: Hadronyche and Atrax. Australian funnel-web spiders are medium to large in size and vary from one centimeter to 5 centimeters in length. The male funnel-web is more lightly built than the female. Both sexes have a body color that can vary from black to brown, but the hard carapace covering the front part of the body is always sparsely haired and glossy. Not all species are known to be dangerous, but several are renowned for their highly toxic and fast-acting venom. Funnel-webs make their burrows in moist, cool, sheltered habitats—under rocks, in and under rotting logs, some in rough-barked trees (occasionally metres above ground). They are commonly found in suburban rockeries and shrubberies, rarely in lawns or other open terrain. MINTAGE: The Perth Mint will release no more than 1,000,000 of these coins worldwide in 2015. REVERSE: The coin’s reverse features a large funnel-web spider, displaying its sprawled legs and hairy body. The design also includes the inscription AUSTRALIAN FUNNEL-WEB SPIDER, the 2015 year-date, the coin specifications, and The Perth Mint’s traditional ‘P’ mintmark. OBVERSE: The coin’s obverse depicts the Ian Rank-Broadley effigy of Her Majesty Queen Elizabeth II and the monetary denomination. PACKAGING: These bullion coins are presented without capsules in protective tubes of 25 coins. There are 20 tubes to a box. Each tube is sealed with The Perth Mint’s tamper evident security seal. Last year saw the debut of a new series of bullion coins from collector favourite, the Perth Mint. Released much earlier in the year that it’s usual triumvirate of semi-numismatic silver bullion coins (Koala, Kookaburra, Lunar), and with a considerably higher fixed mintage at one-million units, the first coin depicted one of Australians best-known threats to human life, the Saltwater Crocodile. It was a hit and the mint sold out in just a couple of months. 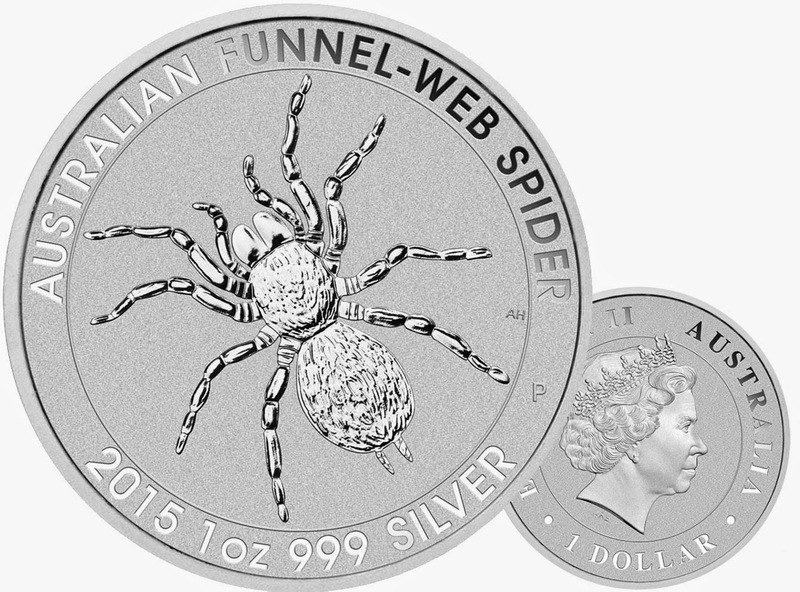 Fast forward to 2015 and yet another of Australia’s menagerie of psychotic killers gets its own coin, the Funnel-Web Spider. Growing up to 5cm in length (the spider, not the coin…), these quite beautiful creatures are capable of inflicting a particularly nasty bite, and doing it in your own garden. Nice. The fangs in particular are an arachnophobes worst nightmare, along with their ability to walk along the bottom of your water-filled swimming pool for a couple of days while still being able to attack you. The coin follows last years quite closely in design concept, a clean representation of the animal on a clean background, with all the inscriptions in a bordered surround near the rim. The spider lends itself well to this style, and we think it’s actually a slight step up from last years design as the crocodile seems a difficult animal to get right on a coin, although Perth did a good job twelve months ago. Available in 25-coin tubes, or in monster-boxes of 500, it’s a low-premium, good quality silver bullion coin of good design and restricted mintage. Only available in the one-ounce format, there were no proof, or other collector versions of the Saltwater crocodile released last year, so we wouldn’t expect any of this either. Seems like a bullion winner to us. At present we’ve only seen it up for bulk sale at Texas Precious Metals, a big Perth Mint bullion dealer in the US, but expect this to crop up in loads of places over the next week.